What are UN-Certified Bulk Bags? UN-Certified Bulk Bags are designed to store and ship highly hazardous materials and substances. These are made from highly durable material which is proven to prevent leakage or contamination of the hazardous material by internal or outdoors contamination. What are the advantages of UN-Certified Bulk Bags? UN-Certified Bulk Bags are specially made to carry highly hazardous materials safely. These come with insulating liners or without them. What are UN-Certified Bulk Bags useful for? 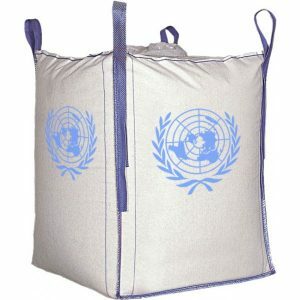 The UN-Certified Bulk Bags are made specially to carry very hazardous industrial waste efficiently. These are made in different sizes, shape and weight capacity to suit the individual requirement of each customer. Why choose Simplex Chemopack UN-Certified Bulk Bags? Simplex Chemopack Private Limited is a renowned provider of advanced and efficient bulk bags and other storage solutions. The UN-Certified Bulk Bags from Simplex are designed using the best quality and safest material to ensure better protection. These bags are designed in various shapes and sizes according to the individual needs of the customers.